Traditional pizza is a perfect example of how carbs of most meals are just a vessel to deliver the good stuff (the greasy fatty goodness). Find a way to substitute a carb vessel for one just made of fat/protein, and life is golden. 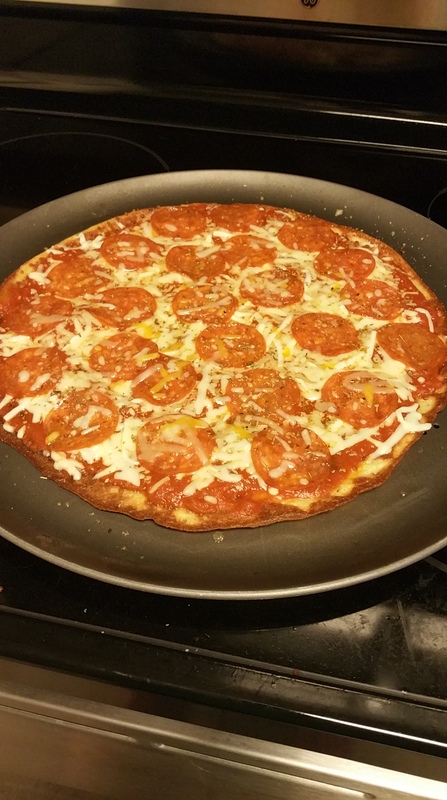 Fathead pizza crust is made out of mozzarella cheese, ground almonds, cream cheese, egg and seasonings. This will turn into a dough which can be rolled into a pizza. Add any low carb pizza toppings of your choosing. If you are strict about keto, then it’s important to find a pizza sauce that has no added sugars. Rao’s is the perfect brand for this, and there is no nasty inflammatory soybean oil in it either. Pay the extra money to avoid processed soybean oil whenever possible. Note: A lot of recipes on Keto call for Almond Meal or Almond Flour. This can be expensive in the store, but I buy this one on Amazon subscription to buy in bulk and save 15% on the price. 1/2 tsp dried rosmary, or other herbs like italian seasoning, garlic powder, etc. Whatever you like. In a microwave safe bowl, mix mozzarella cheese and almond flour. Add in cream cheese. Heat in microwave for 60 seconds. Stir. Heat another 30 seconds. Add in the egg, salt and herbs. Stir well to form a “dough”. Sometimes you may need to put the mixture back into the microwave if it’s hard to stir, but if you do only do it for 10 or so seconds to avoid cooking the egg. Place the dough on a Sil pat or a piece of parchment paper. Put another piece of greased parchment paper on top. Roll into a circle or rectangle. Remove top layer of parchment. Move the silpat or parchment paper to a cookie sheet. Poke holes in various places of dough to prevent air bubbles. Bake for 10 minutes. Flip the crust over (a pancake spatula works well), and bake for another 3-5 minutes. The crust should be ready now, so just add your toppings and bake for another few minutes to warm the toppings of choice. 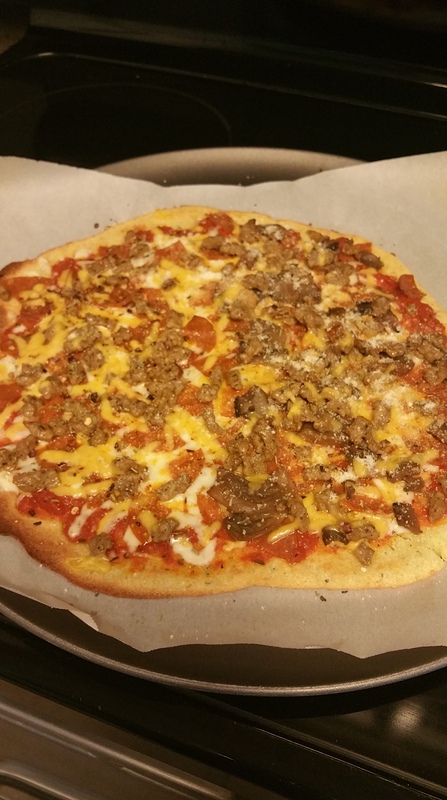 Since making this pizza, I’ve found an even better recipe especially if you like thin crust. Check it out here. Looking for easy and instant pizza crust? 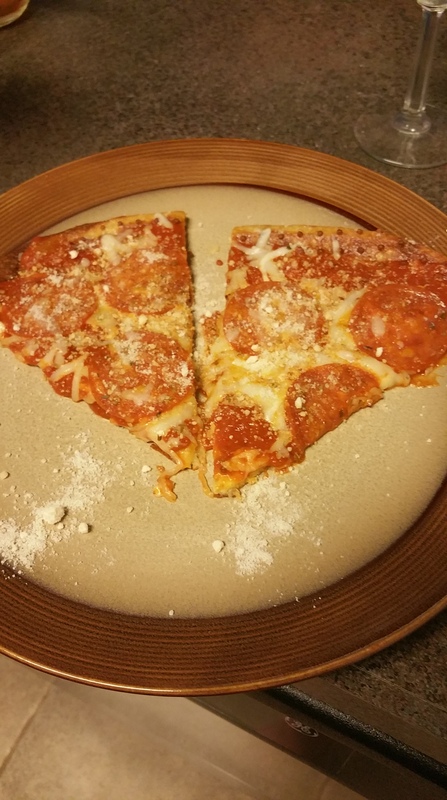 Read my post on Cali’flour crusts here.